Repertoire came out in spring of last year but is brand new to my collection. I brought it with me on my trip to New Orleans* so I could peruse it over the holidays and I’ve already earmarked pretty much every other recipe to make next. Her kitchen style is right up my alley, homey but grand. I mean, hello - Duck Rillettes from scratch and Maple Blueberry Cornmeal Cake? Please get in my life immediately. Normally I’d have made half the Mains section before I’d consider a salad, especially a fruit salad. But something about being on day 5 of a virus made me pass right on by the Chicken and Herbed Dumplings, Beans and Greens, and Panko-Parmesan Chicken Cutlets that have my name written all over ‘em (amen) and make this punch of vitamin C to the head instead. I’m so glad I did. It doesn’t even matter that the powers of vitamin C are probably a myth because I already feel better just from eating it. This fresh and simple winter salad is sunshine in a bowl, exactly what I needed after a weekend of rain. It has a surprisingly complex flavor, especially for one that consists mainly of oranges and avocados. Oh, and the shallot vinaigrette is a keeper for sure. It’s perfect. I added the nuts, cilantro, and Aleppo pepper, and did appreciate the extra crunch and spice, but this recipe understands you’ve got to use what’s on hand. I’m thinking it’d be nice for a brunch, wouldn’t it? Definitely one for the repertoire. In a small bowl or ramekin, whisk the mustard and lemon juice together with the very tiny shallot bits, and let it sit for at least 10 minutes. This time allows the harsh bite of the shallot to mellow. (It took closer to 20 minutes to get as mellow as I like, fully marinated, no harsh bite.) Whisk in the olive oil and continue whisking until the dressing is emulsified. Alternatively, you can whisk together the dressing in an old mustard bottle and shake it up just before you use it (highly recommend). For the larger fruits: Using a sharp knife, slice off the top and bottom of the fruit to create two flat surfaces. Then carve down the sides to remove the skin and pith, like this. [Note: My knives are dull / I got impatient and felt like I was wasting too much, so I peeled the skin by hand and shaved off the pith with a knife.] Remove the segments with your hands or cut into shapes of your liking. For the smaller fruits, no knife required. 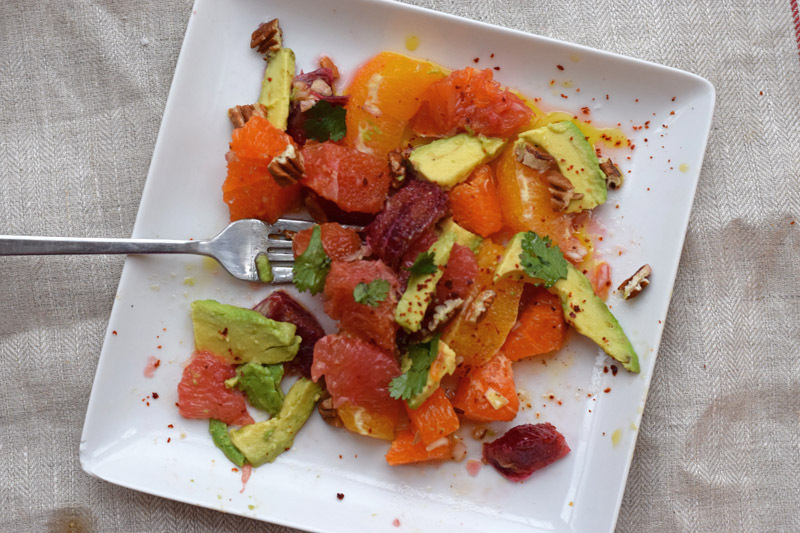 Arrange the citrus segments and avocado slices nicely on a plate. (It will probably still look messy, see above lol.) Spoon some of the shallots from the bottom of the vinaigrette directly onto the salad, then drizzle on some of the liquid. Sprinkle the toasted pecans and cilantro over top, and give a final seasoning of flakey salt and Aleppo pepper. Eat right away to cure your cold! 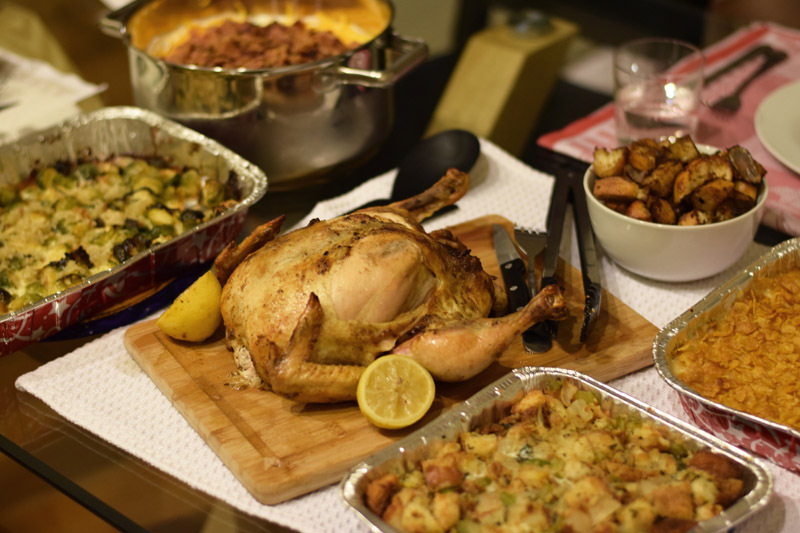 *Speaking of Nola, I found this pic of Christmas Dinner today and it made me miss my momma. Hi Mama!